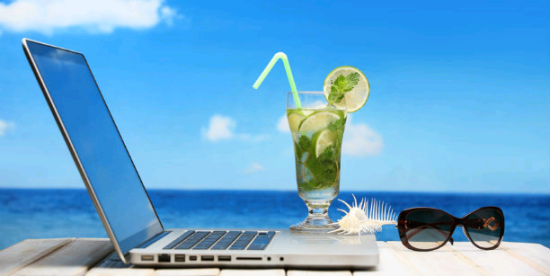 Do You Know What’s Happening In Your Company While You’re On Vacation? If you’re a busy entrepreneur, you probably don’t get to take a vacation very often. Furthermore, when you do spend some time away from the office on vacation, you probably feel compelled to make daily, if not more frequent, calls back to the office to “check in.” You need to know which invoices were sent out, if that big bill was paid, or whether or not that important client finally returned the signed contract. These tasks have to be done during office hours, which is inconvenient no matter how you look at it. If you are in the same country, you have to call during the time that your family wants you to be spending time at Disney World or sightseeing with them throughout the countryside. If you’re abroad, you have to call during the time when you would rather be sleeping. It’s time that you should be spending relaxing, and it takes much longer than it would take if you could just quickly review a list of everything that had happened in the office that day. This is where OliveBox comes in. You probably already know that OliveBox lets you issue invoices, track bills and receipts, and even manage your marketing and promotion efforts, but did you know that OliveBox is even more useful when you are away from the office? You can quickly and easily get an overview of what happened at the office, and you can do it on your own time—not somebody else’s time. Got some down time at the airport heading between vacation spots? Whip out the iPad, log onto the airport Wi-Fi, and log into OliveBox to check the office. Scan through the received invoices for the day, and see who has paid and who hasn’t. Flip past the bills, looking to see if that really important bill came in so you can bill it back to your client. Peruse all of the documents received that day, and see that the contract you were waiting for has been signed and returned to you. OliveBox can even help you track your business SMS and emails, allowing you to send messages and emails to your clients straight from your iPad. Anything that you can do from any computer in the world, you can also do on OliveBox, so you can manage your company virtually without worrying about long distance phone calls or, even worse, international calls. Don’t set up a timetable to call back to the office to check how your company is doing. Rely upon OliveBox to allow you to see for yourself what is going on. OliveBox is your one-stop solution to running your business, from marketing emails to final invoices. Manage your clients, send your email marketing materials, and even check what payments were received, and still have time to play a round of golf with your wife. Busy business owners need downtime, and OliveBox can help you make the most of your recreation time by minimizing how much time you have to spend tending to the office back home.